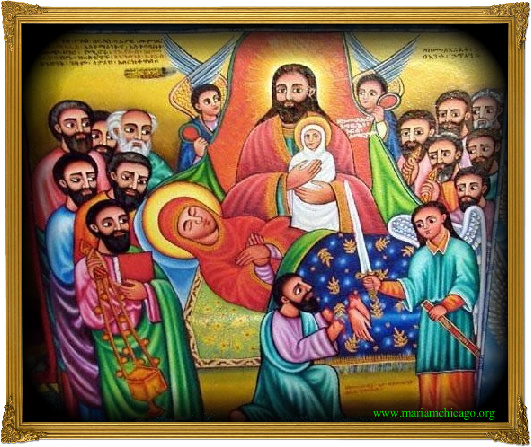 On 1st August 2011, two fasts begin: (1) The Dormition Fast; and (2) Ramadan. We in the Church Calendar begin in another 2 weeks! I've observed Ramadan once, and honestly, it's a toss-up (food-wise). I did drink some juice and water during the day, but all I could do was think about food, food, food, and then I would eat until I got sick once the sun went down. I also would get up at 4:30 AM to eat an immense breakfast (much to the consternation of my roommate). It just seems counter-intuitive. The Orthodox fast makes more sense to me. However, eating hot chunks of grilled lamb kebab from the local Middle Eastern restaurant that was open late for Ramadan...well...kind of makes me waver. May all of us spiritually benefit from this fasting season. Thank goodness you reminded me before lunchtime. [said in Jerry Seinfeld's nasally voice]Why do they call it a fast? It doesn't go fast, it goes slow. They should say that you are slowing. What areeeee they thinking? What is required in your fasting for The Dormition Fast? The symbols for fasting each day are explained at the bottom of the calendar. Let wiki be your guide! Second chance, just let it go. Geez. Thanks for the links, very useful. This fast sounds very strict, but i guess it is self discipline. Try our fasting for Lent and Holy Week. Amen. One could consider threads like this provocative in their very nature. If you are a practicing Orthodox Christian, you know when your fasts begin, on any calendar. Yes, but you may not know that Ramadan also starts today. I was working with Muslims in college years ago, and another Christian friend and I did it privately, just because we wanted to experience the fasting pattern (although I did cheat with drinking juice or water twice a day). Obviously we didn't do the prayer or any of the other rituals involved. Probably not the best idea in retrospect, but I did conclude that I felt that the fast almost defeated the purpose of spiritual fasting, since some Muslims in Muslim majority countries find ways around the fast: closing their businesses during the day, sleeping it off, etc. And they could eat whatever they wanted at the appropriate times! Meh. Salutations to Our Holy Lady Maryam! I'm an Old Calendarist, I'll join y'all next week in such a sacred occasion, though I am quite pleased you brought up Ramadan, its appropriate that we in Orthodox understand that Islam is no more inherently our enemy because of a few Koranic verses than we Christians are their enemies for similar passages in the Old Testament. Rather, because Mohammad himself when in exile in Ethiopia of all places observed the strict piety of Orthodox Christianity and was inspired beyond the superstitious cultist religions he had lived in across the Red Sea in Arabia. Of course there were largely established Arab-Jewish kingdoms at that time but the rural folks of the Peninsula were more inclined towards their traditionalists beliefs, including the Ka'ba cult. Anyways, while in Ethiopia Mohammad was inspired to incorporate Fasting specifically as a fundamental Pillar of Islam after seeing the notorious fasting culture of Ethiopian Christendom which was prevalent even over 1400 years ago! True, Mohammad did highly disagree all his years in exile with the religious imagery which is deeply embedded within the Ethiopian Faith, but that may also play into the pseudo-Jewish influence of the time which of course favored iconoclasm. It is good to see connections and grounding Islam as a culture and religion separate from the Jihadists misappropriation of that religion, because Charity and Fasting as important as Prayer and doctrine in Islam. The sheer vast majority of Muslims are simple, pious folks who much like ourselves, spend a good deal of time in prayer, fasting, and doing charitable deeds as a form of common religious hospitality. During Ramadan then, when we Orthodox are serendipitously fasting at the same time as the Muslim communities, I enjoy to fellowship with them in the spirit of friendship and mutual tolerance. One, why would I care. I am not a Muslim. And two, since I am an Old Calendarist, any coincidence regarding the date would be lost on me since there is no coincidence with my Calendar. To be clear, you did nothing wrong with your post (at least in my opinion, for whatever that is worth). It just tends to become an issue on "mixed" boards such as these. My wife, who is a New Calendarist, would have fully appreciated your post in the manner that you intended it, not because she is a Muslim, but because she does most of the cooking in the house and does not have her nose in the Calendar as much as I do since the fasting Calendar on the refrigerator is a Serbian one.. I thought it was a good post, especially for those of us that are not Orthodox, and just looking in to it. I learnt something new about your faith and The Dormition Fast. Ramadam I knew about anyway, and we should make friends with the Muslims, they are our neighbours, not our enemies apart from the radicals who are not Muslim, only use it in a way it was never intended. It is good to see connections and grounding Islam as a culture and religion separate from the Jihadists misappropriation of that religion, because Charity and Fasting as important as Prayer and doctrine in Islam. As important in Islam as in many world religions... It's possible to find connections between Christianity and other religions. Buddhism has priesthood! The sheer vast majority of Muslims are simple, pious folks who much like ourselves, spend a good deal of time in prayer, fasting, and doing charitable deeds as a form of common religious hospitality. Those are heretical Muslims. No genuine Muslim that reads and follows the Qur'an would be pious and tolerant. It is unthinkable. During Ramadan then, when we Orthodox are serendipitously fasting at the same time as the Muslim communities, I enjoy to fellowship with them in the spirit of friendship and mutual tolerance. Do you show the same love and tolerance to Jehovah's Witnesses and Mormons? Mormons have pious folks too. They do not even smoke! Sure. I may invite a demon to my evening prayer soon. If we can be nice to Muslims, we can be nice to demons and Satan too. Before I entered the Orthodox Church, I observed Lent, but using the Islamic fasting rules of Ramadan. The reason was because I didn't know about the Orthodox Church at the time, and other Christian churches didn't seem to observe Lent with fasting (including the RCC). Having gone to university in Manchester, on the other hand, meant that I knew plenty about Islamic religious practices. Anyway, like you I didn't benefit very much from the fast, as you do end up stuffing yourself with food as soon as the sun sets. The Orthodox fasting rules, given to us by the fathers of the Church, are certainly better in encouraging a person to eat less and loosen his obsession with food; the Muslim practice encourages people to be obsessed with food... as that's all you're thinking about all day long! Actually yes, Jehovah s witnesses, seven day Adventist's, Budists, Muslims, in fact everybody. or did you forget the words of Papa Jesus? I tell ya the hardest thing for me, has been trying to cut our dairy products. Dairy is in everything! Some kinda cheese or milk is even in potato chips, grr. I wonder how complicated this must make life for a vegan! I can cut out meat easily, just the cutting out "dairy" for the fast is something else -- anyone else have trouble with the dairy? I don't. Since I don't look at every ingredient on the label like some kind of pharisee, but make a simple good faith effort to avoid things like milk, butter, ice cream, sour cream, cheese and the like, I don't let 0.005% whey in a product get me too uptight. In reality, if you don't make your own food, it is difficult to know exactly what is inside. I am pretty sure that whomever dreamed up the fasting rules did it well before the advent of processed foods. I agree with a number of points you are making here, but do you have to be such a curmudgeon? but do you have to be such a curmudgeon? I think that Punch has made it clear he is not fasting - yet. You said, "...I don't look at every ingredient on the label like some kind of pharisee"....you know what's interesting? As strict as Orthodox Jews tend to be with the laws of kashrut, they're actually not as strict as some might think. For example, while EVERY bit of chametz (leavening) MUST be out of EVERYTHING for Pesach (Passover)...as St Paul said, "A little leaven leavens the whole lump", they are not as strict with non-Passover foods. Cheese contains rennet, a binder to hold it together in firmness. Most rennets are animal-based, and most use pig ingredients which are not kosher. Kosher cheese contains animal rennet, but it is from a kosher animal, such as a cow. Yet doesn'tt his violate their prohibtiion against mixing meat and dairy? The rabbis say that the rennet has been so changed by the processing required to turn it into rennet, that such a tiny amount of animal product remains, so therefore it is acceptable. Is that true about the cheese being made with part of processed animals? Brother, I'm not going to argue with what you are saying but I do feel I can't be exactly silent on the matter out of my conscience, but I will only say that you are greatly misinformed in some comments you've made above and I pray for you, me, them, and us all. If the Muslims are such nice people, how did the Hagia Sophia become a mosque? Just a thought. Personally, I find oil to be a bigger challenge, but at the same time avoiding oil really simplifies things and almost forces you to eat what you should be eating anyway (fresh fruits, nuts, boiled or raw vegetables, beans, etc.). Oil of one kind or another is in practically everything that is packaged. Tariq used to do that. Have that hungry wolf look about him all day and then come sundown he would stuff himself with food usually junk stuff because it was the quickest and most nicest smelling. Then he would have a food belly for the next three hours and not be able to even move haha... so that was the evening gone and he always fell alseep because of the heavy meal thing lolOl Ramadan kills romance i think. Not that it applied to me and him. You misinterpret my statements again! I was not even sarcastic, only added a bit of irony into my response. You are free to call me bigoted, jerk, rude, prejudiced.... though. One point needs clarification: I do not hate Muslims, but Islam. However, I would never trust Muslims. They have but one ideal: to conquer the world and make non-Muslims submit to Muhammad's ideology through every means of humiliation. This is what Islam actually means (submission)! You are evidently unaware of this fact. I shall pray for your enlightenment. I know about that Poppy; They not only have to not eat, but - horror of horrors - not SMOKE! Needless to say, by 4 pm they were dangerous on the Jerusalem roads and not too polite in their shops either! and then come sundown he would stuff himself with food.